Rocks & Co. believes that mining should never be at the expense of communities, workers or the environment. All mining should be sustainable; protect water sources from chemicals, debris, rubbish, silt and biological pollutants; minimise the destruction of flora and fauna; and restore mined land as close as possible to its original condition. Fully integrated with a premiere selection of international jewellery artisans, all Rocks & Co. jewellery is crafted to precise specifications using authenticated quality materials. All our gemstones are authenticated by internationally respected gem buyers with over 20 years of experience. We also use gemmological laboratories for analysis and confirmation where necessary. All possible steps are taken to authenticate the origin of our gemstones and to ensure all gemstone enhancements applied are fully disclosed and permanent with normal daily wear. Purchasing from known and trusted sources, we can guarantee that our gemstones have been purchased from legitimate sources not involved in funding conflict or terrorism. 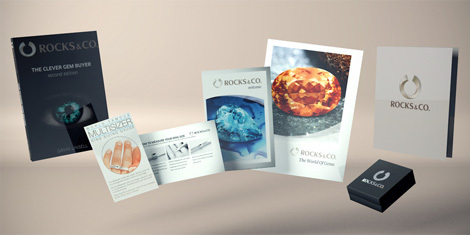 Rocks & Co. fully complies with the Kimberley Process, the global system to eradicate Conflict Diamonds (also called Blood Diamonds). You can learn more about the Kimberley Process by visiting www.diamondfacts.org. Rocks & Co. fosters responsible corporate citizenship by making regular donations to both domestic and international charities. Routinely spending time in mining communities in Asia, Africa and South America, our gem buyers fully appreciate the standard of living improvements sustainable gem mining affords. To this end, we support educational initiatives as well as emergency relief. If you represent a charity, please contact us to see how we can help. Rocks & Co. sells jewellery that has been made using legitimate labour employed under conditions that conform to local labour laws. Rocks & Co. strongly opposes any unfair labour practices. We also believe all employers should provide a safe working environment.